Starting on May 1, Labor Day, until July 31, consumers can enjoy lower remittance rates from Smart Padala whenever they send money to their loved ones, wherever they are, as the the country’s leading domestic remittance services provider launches its Padalang Padalow promo in honor of our hardworking Filipino workers. With the enrolment season coming up soon, Filipinos can take advantage of Smart Padala’s low remittance fees to send much-needed money to their loved ones across the country. For padala above P3,000, customers will only pay a nominal fee of 2% of the remittance amount, instead of the usual 2.5%. For P3,001 to P3,500 padala, customers will only have to pay P70 instead of P87.50; and P5,000 padala for only P100 from P125. 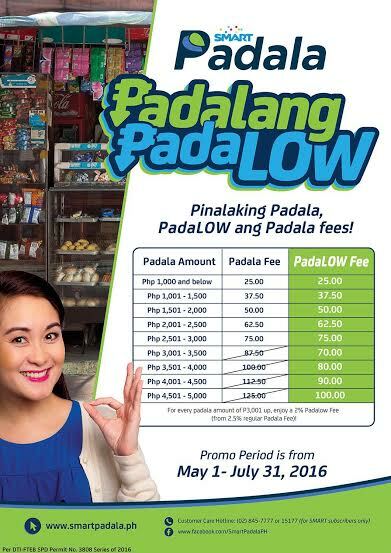 The Padalang Padalow promo can be enjoyed until July 31 through 15,000 Smart Padala partner centers, the biggest network of non-bank money-in and money-out touch points. “For over ten years now, Smart Padala has been a strong enabler of Filipinos for sharing the fruit of their hard work to their families and loved ones. This Labor Day, we are giving back and honoring our kababayans through our Smart Padalang Padalow promo with the same reliable and convenient remittance service that they can truly benefit from,” said Benjie Fernandez, co-CEO at PayMaya Philippines, the digital financial services unit of PLDT and Smart Communications, Inc. (Smart), which offers Smart Padala for the remittance market. More convenient as it is more affordable. Launched in 2004, Smart Padala is the global pioneer in mobile money remittance. The brand, which literally means “smart remittance” resonates with Filipinos as it reflects our culture of providing assistance to loved ones as a show of affinity. Its network of hyperlocal touchpoints can be found in close proximity to neighborhoods and communities, making domestic Based on data from the first National Baseline Survey on Financial Inclusion released by the Bangko Sentral ng Pilipinas mid-2015, it is estimated that on average, Filipinos take around 22 minutes to reach the nearest financial services touch point. It also costs an average of P43 for a roundtrip fare. This is on top of the remittance fees collected by service providers. redeemable at any of the Smart Padala centers nationwide. With Pick-Up Anywhere, there is no need to travel far just to send or receive remittance because Smart Padala centers can literally be your kapitbahay or your suking sari-sari store. “We feel the need of our Filipino workers for a reliable, accessible, and convenient way of sending money. The least that we can do is offer them services that are easy, convenient, and affordable. This is why we have introduced enhancements such as Smart Padala Pick-Up Anywhere and offered promos like Smart Padalang Padalow,” said Lawrence Ferrer, Vice President and head of domestic business at PayMaya Philippines. PayMaya Philippines, part of the Voyager Group, is the digital financial services unit of PLDT and Smart Communications, Inc. (Smart). PayMaya, its mobile app that comes with a prepaid card, is now the leading over-the- top digital payments app in the Philippine market. Among its innovations include Smart Money, the pioneering mobile money service linked to the Smart SIM and mobile phone and Smart Padala, the leading domestic remittance service brand in the market.